Meet New Investigator Erika Boesen, Ph.D. Your kidneys play a vital role in maintaining your overall health, including controlling the levels of salt and water in the body, thereby controlling your blood pressure, and also eliminating excess fluid and waste products. My research interests center on better understanding how the kidneys work normally, and on understanding factors that cause injury to the kidneys in several different diseases so that we can intervene in these processes and protect the kidneys. The two areas my lab is currently funded to investigate are acute kidney failure and kidney injury that occurs in the autoimmune disease lupus. Specific treatments for acute kidney failure are completely lacking, while treatments for lupus are inadequate and have major side effects. The long-term goal of our work is to develop much-needed new treatment options for patients with these serious conditions. This was the punch line of a much longer conversation, but "You gotta try." I think a lot of us, especially young women, needlessly hold ourselves back through lack of self-confidence or by catastrophizing possible outcomes that may not (and frequently don't) eventuate. I'm trying to make myself take more chances on things actually working out! Despite my classically Danish surname, we recently found out this name was adopted and our ancestors were actually French. So that's why I'm not tall and blonde. . . Both my parents and I have science degrees, but my sister is an actress and knows Oscar-winner Geoffrey Rush. I have a small heart defect, and in early 2014 got to watch an MRI video of my heart beating. It was really cool! 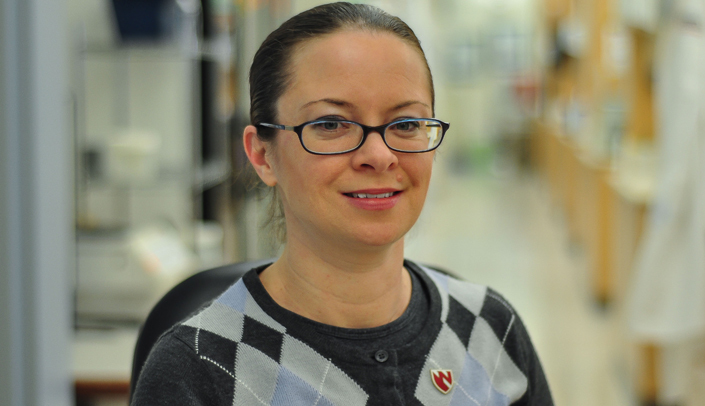 Though Dr. Boesen is a new investigator on our campus, she has already started making her mark on students in the department of cellular and integrative physiology. Her willingness to mentor students and share her scientific and technical expertise is outstanding. She is a true asset to our university and the culture of science here at UNMC!